Lowden guitars are a breed apart becouse of the innovative soundboard bracing design, including the “dolphin” strut profiles (which are top and side voiced for optimum weight & stiffness), the bridge design, the finish inside the soundbox, as well as the methods of assembly chosen and the blends of differing woods. George considers it fundamental to the integrity and future of the Lowden guitar that he continues to build guitars personally. By keeping his hands on the wood and designing new guitars for individual musicians, inspiration and the creative edge continue to be challenged. 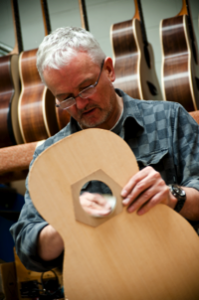 The integrity and passion of George and his dedicated team – recently described as “Olympic guitar making” – which goes into each and every Lowden guitar, has never been stronger. Click HERE to get an impression on how the Lowden guitars are made.